"The very nature of rituals means they also serve to remind us of things that are different from years that have gone before. Of people who are no longer seated around the same table, of fallings-out, of break-ups, of those who have passed away. The season is inescapable, and so we have no choice but to adapt. Make new rituals, or embrace the old ones as best we can." Moving from eating Christmas pudding poolside in Australia, Kate Young writes about learning to embrace England's snowy skies, long Boxing Days walks and new festive traditions in our midwinter issue. 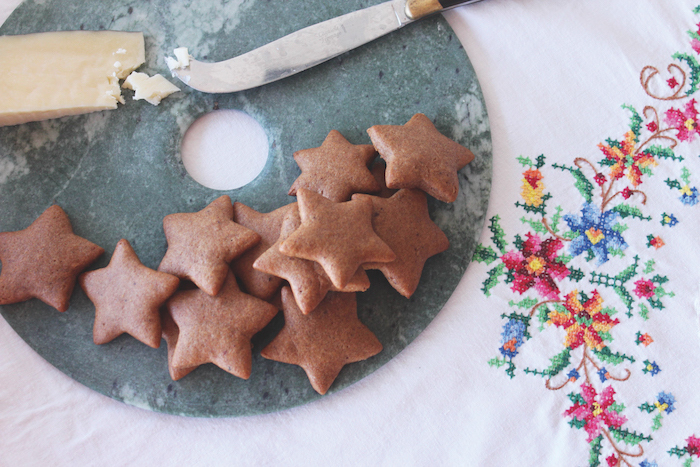 Start one of your own by trying her recipe for pepparkakor, a spiced biscuit that's great to eat with cheese. 1 Bring the water, syrup, sugars and spices to the boil in a small saucepan over a low heat. Pour them over the butter into a mixing bowl and leave for a few minutes to cool. The butter should have completely melted by this stage. 2 Sieve the bicarbonate of soda and flour into the mixture. Stir to combine and bring together in a dough. Leave the bowl in the fridge for a couple of hours, or preferably overnight. 3 Preheat the oven to 200ºC. Flour your work surface and roll the dough out as thinly as you can – a couple of millimetres thick is about right. Line your baking trays. Cut shapes out of the dough, with cookie cutters of your choice, and arrange them on the tray, leaving a little space for them to spread slightly. 4 Transfer each batch to the oven and bake for five minutes, until slightly crisp around the edges. Leave to cool on the tray for five minutes and then completely on the wire rack. The biscuits should be crisp around the edges. Serve plain or with cheese – they’re lovely with Swedish cheese, or good cheddar or Stilton. Read Kate's piece about changing Christmas traditions in the midwinter issue of Oh Comely, out now. In our second instalment of flavourful recipes from Meera Sodha, who features in issue 31, we bring you Gujarati Dal, a weekend dish you can take your time over. Meera says: "This dal is my and every other Gujarati’s taste of home. One spoonful and I am transported. It has a more complex taste than most dals due to the subtle jabs of star anise, curry leaves and lemon, all rounded off with the sweetness of honey. Because of the time it takes to soak and cook toor lentils, this is more of a weekend dish in our house, although a daily staple across Gujarat." Soak the toor lentils in cold water overnight, or in warm water for an hour before cooking. When soaked, wash the lentils in a few changes of cold water until the water runs clear, then place in a saucepan and cover with 4cm of cold water. Add the star anise and set to boil over a medium heat. The lentils will take around an hour to become tender (so you can crush them easily with the back of a spoon), and you may need to remove the scum that forms, using a large spoon. While the lentils cook, you can prepare the tempering. Put 2 tablespoons of oil into a frying pan over a medium heat. When hot, add the mustard seeds, cumin seeds, cloves, green chilli and 6 curry leaves. Stir-fry for 2 to 3 minutes, until you can smell the spices, then add the tomatoes. Cook for around 5 minutes, until the tomatoes become soft and paste-like, then add the turmeric, salt, honey and lemon juice. Cook for a couple of minutes, then turn off the heat. When the lentils are cooked, whisk them to thicken, then add the tempering. The mixture will be quite thick, and Gujarati Dal is normally thin, so add at least 200ml of hot water (or as you prefer), then simmer for a further 15 minutes. Check that the salt, lemon, chilli and honey are to your liking, then take off the heat. Put another tablespoon of oil into a separate frying pan and, when hot, add a sprig of curry leaves and the crushed nuts. Fry until the curry leaves crisp up and the peanuts brown, then take off the heat. Transfer the dal to a serving dish and scatter over the curry leaves and the peanuts. Serve with steamed basmati rice, a green leafy vegetable curry like the savoy cabbage and a side of yoghurt and pickles. Meera's book, Fresh India, is out now. In issue 31, we investigate the history of cocktails in all their weird and wonderful glory. Whether you're drinking to remember or to forget this weekend, we thought you'd appreciate a lesson in creating the particularly tropical, highly infectious, Zombie. Cocktails – with their numerous ingredients and complicated preparation techniques – are seen as drinks for special occasions; perhaps if beer came with a little umbrella or a sparkler we might think of it the same way too. Novelty drinking places emphasis on presentation – at its most evocative, cheesy and wonderful in the Tiki Bars of the pre- and postwar period. Serving rum-based drinks like Zombies (also known, thrillingly, as “skull-punchers”) in coconuts and pineapples, these romanticised impressions of Polynesian culture understood that a good cocktail feels like the first day of a holiday. You can serve a Zombie in a Hurricane glass too, or a tumbler, we're not fussy. Mix all ingredients together apart from the 151 in a shaker with ice. Pour into the glass and top with the 151. You can also set this drink on fire if you're feeling particularly exasperated/celebratory. Find more cocktail inspiration in issue 31 of Oh Comely, out now. After a particularly fruitful foraging* session last week, our lifestyle editor found herself with a fridge full of wild garlic and one craving: pesto. But what to go with it? Here’s a homemade twist of the student classic. Remember, wild garlic has a quite a short season, so if you want to try this you’ll have to track some down by the end of May. One. First make the pesto. Put all the ingredients asides from the olive oil into a food processor and blitz them. Slowly add the olive oil until it resembles what you’d find in your old faithful jar of shop bought pesto. Two. Next get cracking with your gnocchi. Start by placing all the spinach in a colander and pouring boiling water over it to wilt it, then run the cold tap over it to cool it down. Next use your hands to squeeze the excess water from it - don’t be shy, you won’t hurt it. Three. Place all of the ingredients into your food processor and blitz until combined. If you were shy with your spinach, you may need add more flour to soak up the water and make the mixture more doughy. Add it slowly mixing by hand until you feel happy (or too worried to add more). Four. Put your mixture in the fridge to cool for 30 minutes. Five. Bring a well filled pan of salted water to the boil and retrieve your mixture from the fridge. Now, there are two ways to get shape your gnocchi; if you’re a dab hand with the chef-y two teaspoon technique use that, if not, pull off a bit and carefully roll between your palms. It’ll be quite sticky and messy, but hey, who minds a bit of mess?! You’ll need to cook them in batches, so it’s easiest to shape as you go along rather than do them all at once. Pop each round into the boiling water. At first they’ll sink, then when they’re cooked they’ll bob up to the surface. Lift them out with a slotted spoon and set aside. Six. Once you’re gnocchi are all cooked, heat a knob of butter in a frying pan. Sauté your gnocchi to seal them (but not brown them) and add in the pesto to heat through. Seven. Serve with grated parmesan and some sprigs of parsley. Recipes adapted from Great British Chefs and Good Housekeeping. *NB. When picking garlic (or any other plant for that matter) try to stick to the rule of thirds; pick a third of the plant and leave two-thirds. Homebaking isn't about perfection; it's about making something to share, taking time away from a screen or just satiating that need for something sweet without spending £3.50 on a single muffin. For this Recipe Friday, our lifestyle editor Liz Seabrook picked some rhubarb from the garden and made a birthday cake for her mum with the things she could find in the kitchen cupboards and the garden. And don't worry, she didn't mind the slightly singed sugar one bit. One. Preheat the oven 180°C, fan 160°C, gas 4. Grease a 22cm springform tin and line the base and sides with baking paper. Two. Put the butter and sugar in a bowl and cream together with an electric whisk until pale and fluffy. Whisk in the eggs one at a time until creamy. Add the ground almonds and orange zest, sift over the flour and baking powder and mix well. Three. Spoon half the mixture into the tin, carefully spreading it right to the edges. Arrange just under half the rhubarb on top, keeping it away from the edges of the tin. Sprinkle over 1 tablespoon of the extra sugar. Four. Spoon over the rest of the cake mixture, then spread it to cover the rhubarb. Arrange the rest of the rhubarb on top, in a circle, filling in any gaps (keeping it away from the edges). Scatter over the flaked almonds and sprinkle with the remaining extra sugar. Five. Bake for 1 hour until golden, cover with a tent of foil and bake for another 10-15 minutes until firm to the touch in the middle. Leave in the tin to cool before transferring to a wire rack. If not serving warm, allow to cool completely. We recommend serving warm with a drizzle of ginger syrup and maybe some icecream! Mmmm YUM! Recipe adapted from Sainsbury Magazine to be gluten-free using Doves Farm gluten free self raising. Baked Alaska is an absolute classic meringue recipe. We have given it a Meringue Girls twist by combining a zesty lime and coconut sponge with mojito sorbet and blowtorched brown sugar Italian meringue. A proper summer holiday on a plate. Don’t forget your cocktail umbrella! One. Put the lime juice, rum and icing sugar into a bowl and whisk until the sugar has dissolved. Stir in the water, lime zest and mint. Pour into an airtight container and freeze overnight. Due to the alcohol content this sorbet sets softly, so use it quickly. One. Preheat the oven to 170°C/gas 5. Butter a large baking tin (approximately 24cm x 18cm) and line it with non-stick baking paper. Two. In a large bowl or using a stand mixer, beat the butter and sugar together until light and fluffy. Add the eggs one at a time – the mixture may start to look split, but don’t worry. Add the flour, coconut, lime juice and zest and fold gently until you have a smooth batter. Pour the mixture into your baking tray and smooth the surface with a spatula or the back of a spoon, then bake for about 20 minutes, until the cake is golden and springs back when pressed. Three. Run a knife around the edge of the tin, turn the cake on to a cooling rack and leave to cool completely. Once completely cool, cut out 8cm diameter circles from your sponge. We’ve used a cookie cutter, but a knife around a tumbler is fine. One. Put the egg whites and 1 tablespoon of the caster sugar into the bowl of a stand mixer, fitted with the whisk attachment, or use a clean glass bowl with a hand-held whisk. Don’t start whisking yet. Two. Put the remaining caster sugar, light brown sugar and water into a heavy-based saucepan and place over a medium/high heat. (Don’t stir, as this can cause the sugar to crystallize and you’ll get crunchy bits in your meringue!). Once the sugar has dissolved and the mixture is boiling, attach a sugar thermometer to the pan and continue to boil without stirring until the syrup reaches 120°C. Then take the pan off the heat. Three. Now turn the mixer on to high speed and whisk the egg whites until stiff peaks form. Reduce the speed to low and carefully pour in the hot sugar syrup in a very slow steady stream. Be careful to add the syrup directly to the egg whites, without it touching the side of the bowl or the whisk on the way down, otherwise it will cool before it hits the eggs. Once all the syrup has been added, turn the mixer on to high speed and keep mixing until the sides of the bowl feel cool. Finally. Place your four sponge circles in your desired serving dish. Using an ice cream scoop, place a perfect scoop of mojito sorbet on each sponge circle. Working quickly, cover the sorbet and sponge with Italian meringue – a mini palette knife is useful here. Blowtorch to a golden caramel colour and serve immediately with a cocktail umbrella. If the above sounds like too much effort, head down to Broadway Market to buy ready made sweet treats. Original recipe and image from the MG’s latest book Meringue Girls: Everything Sweet out now and published by Square Peg. One. In a large bowl place the ground almonds, caster sugar, icing sugar and spices, then mix together. Two. In a seperate bowl beat the whole egg, yolk, extracts, lemon juice, honey and brandy together and pour onto the almond mix and mix together well. Three. Once the paste is made, roll out in around 15g balls nice and smooth (you should get around 38). Four. Then using the blow torch or under a grill, singe the marzipan moments to a golden singe brown.Don’t be scare to burn them a little as it really adds to the depth of flavour which balances the sweetness and it is delicious. These little treats from Bread Ahead were inspired by the bowl of nuts you always have at Christmas that are still sitting there in the spring, and all those half-opened packets of nuts that sit at the back of the cupboard. You can use any type of nuts, just keep the quantity the same in total. 150g plain flour, plus extra for dusting. One. Roast all your nuts together in a preheated oven at 160c for 12-14 minutes or until golden brown and then leave to cool. Two. Whizz up the nuts in a food processer or chop with a knife until they are small crumbs. Three. In an electric mixer with the beater attachment, or in a bowl with a wooden bowl, cream the butter and sugar together until light and fluffy. Four. Add eggs one at a time making sure all incorporated, then the flour and nuts and mix together, wrap the paste in cling film and chill in the fridge for a few hours. Five. Take out the fridge and let soften a little but not too much as it will get sticky until you can roll out, roll out to 5mm thick and cut out using a 7cm cutter, place on a lined baking tray and bake in a preheated oven at 140c for 20-25 minutes or until golden brown. Six. Leave them on the tray for 5 minutes, then put them on a rack to cool. Seven. Once cool tuck in! Don't want to bake them yourself? Pop along to Borough Market on Saturday to pick up freshly baked treats. For this month's Recipe Friday, we'll be practicing proving and baking with Bread Ahead. Opened in 2013, Justin Gellatly and the rest of the team have gained royal clients with their buns. Enriched with butter, these soft buns are fit for the most special of occasions, including the bacon buns the morning after the royal wedding! So why don’t you bake a batch this weekend and treat your mum like a royal. One. Place all of the ingredients apart from the butter in an electric mixer using the dough hook attachment and mix on a medium speed for 6-8 minutes or until it starts coming away from the sides. Then turn off the mixer and have a cuppa for 10 minutes while the dough rest. Don’t have a mixer? Use your hands, it’ll be sticky to begin with but keep going, it’ll get there. Two. Start the mixer up again on a medium speed and slowly add the butter to the dough, once all the butter is added mix on a high speed for 1 minute, then turn off the mixer. Three. Cover the bowl with cling film and let it rest for 10 minutes, then divide into 40g pieces and roll into balls and place on a lined baking tray and cover loosely with cling film. Prove until double in size (about 1 hour). Four. Egg wash and bake in a preheated oven at 200c for around 10-12 minutes or until golden brown. Five. While the buns are still warm fill them! Go wild, bacon, avocado, eggs, tomatoes, extra avocado -- fill them until your heart's content and then tuck in.